We make fresh, handcrafted and customized personal pizzas in less than five minutes. Yep, just five minutes for delicious slices made just the way your customers want! Our five-minute gourmet pizza concept is quickly gaining momentum. Founded in 2011, we’ve opened over 72 locations, operating in 23 states, and have over 192+ commitments for new franchise locations. Customers love how our pizzas taste, but our franchisees love how our business model makes dough! Our customers eat up the creative freedom we give them to design their own pie from one of our four proprietary crusts, seven sauces, and over 28 of the freshest meat and veggie toppings around. Or, they can choose from one of our innovative signature pies. The combinations and favor experiences are endless. Great pizza – fast. Proven business model. Leading concept in its category. Success is easy as pie for our franchisees. 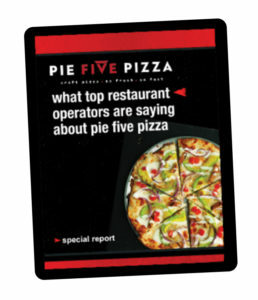 Let them tell you why they chose Pie Five Pizza.